Specimen in Baltic amber. 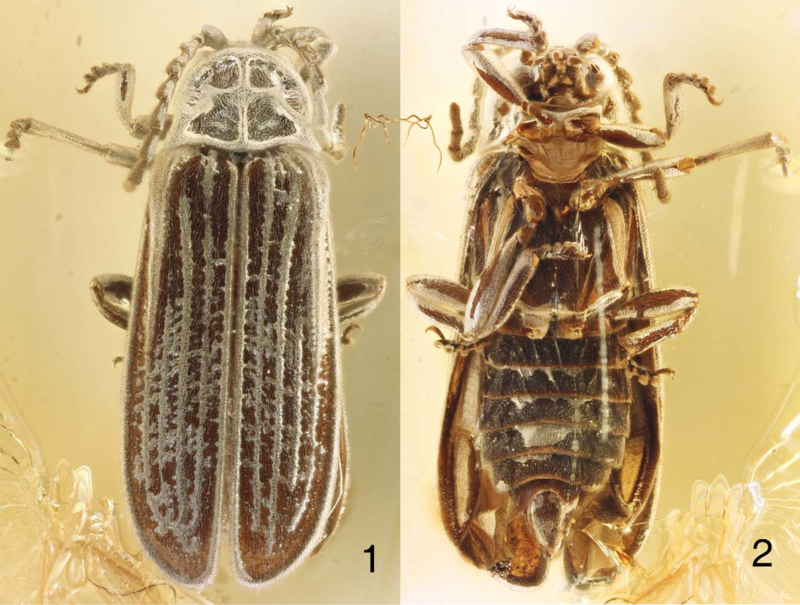 Protolopheros hoffeinsorum gen. n., sp. n.
Totally not sure about this one, just an idea. Lycidae seems like a pretty good guess, but I'm not seeing anything which definitively says it is. Would it be possible to get pictures from other angles, such as from the bottom and side? Also, approximately how large is it? Please note - the insect is about 2mm in length, not including the extended antenna. Thanks again to everyone who is trying to help me out! I'm afraid not. As far as I know, bothriderids have clubbed antennae, which is not what we see here. This specimen's are more serrate. Looks like Lycidae to me too. I have looked at some Kazantsev,and can totally agree with it being some form of lycid .